Wanna make a huge profit on the Royal Ascot DAY 5 this Saturday? 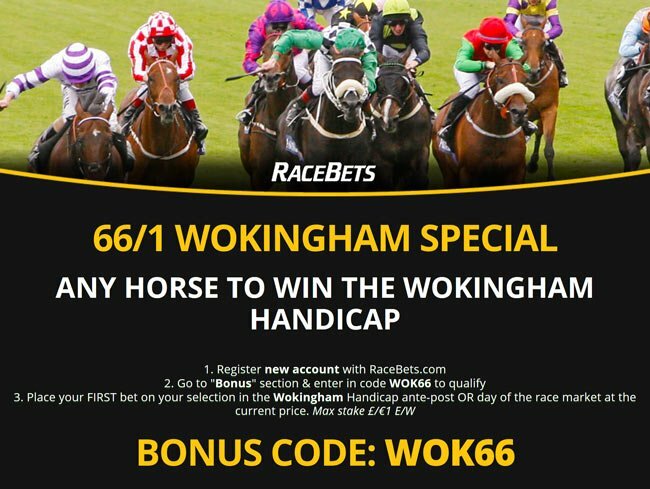 Join Racebets with the bonus code "WOK66" and claim a huge 66/1 on ANY horse winning the Wokingham Handicap at Ascot! Exclusive offer! The Wokingham Handicap is one of the feature contests of the Royal Ascot Festival and bookmaker Racebets is offering a special odds enhancement this year! Bet on ANY horse to win the Wokingham Handicap.. You will be paid out at a massive 66/1! 1. 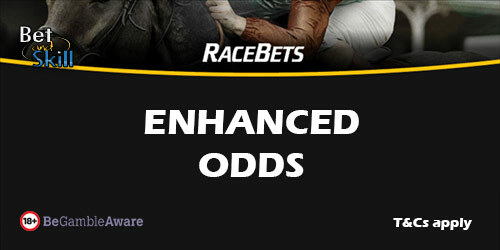 Open a new Racebets account via this special link! 3. Place your first bet on Wokingham Handicap, day of race market at current price (max stake £/€1 E/W)! Please don't forget to mobile verify after you enter the bonus code to claim this offer! Enhanced winnings only applies to win part of each way bets and bets placed over £/€1 will be paid out at the market fixed odds price taken when placing the qualifying bet. When you nake your first deposit, Racebets will give you up to £50 as welcome bonus! Offer is for new depositing accounts only. Offer is for new depositing accounts who place their first bet on the Wokingham Handicap antepost market or the Wokingham Handicap day of race market. You cannot use free bet tokens or bonus cash to qualify for this offer. Maximum stake is £1/€1 E/W. Any amount placed over £1/€1 will be paid out at the current market price of your selection. Day of race fixed odds win bets only. Single, Win bets & win part of E/W bets only. Example: If you bet the winner £1 E/W at 10/1, you will get £101 for the win element of your bet and £3.50 (10/1, 1/4 odds) for the place element of your bet. The enhanced winnings are paid as bonus cash, see further details below. If your selection wins the Wokingham Handicap, you will be paid based on the market price you took first and then you will have the extra enhanced winnings amount added to your account within 24 hours. The extra enhanced winnings will be paid out as bonus cash. You must wager this bonus cash 3 times prior to withdrawal. You have 30 days to complete the wagering requirement. Failure to do so will result in forfeiting the bonus cash and any winnings associated with the bonus cash. Customers using Moneybookers, Skrill, Neteller or Paysafecards to deposit will not qualify for this offer. If you avail of this offer you cannot claim the first deposit welcome bonus. You will have to mobile verify to claim this offer. Should the terms and conditions of any promotional offer be breached or should evidence be found that betting activity, either by one customer or a group of customers, has been carried out that guarantees a profit by taking advantage of free bets, enhanced payouts, deposit bonuses, or any other promotional offer, RaceBets reserve the right to take back any bonus that has been granted and to declare that bonus as void. Get 33/1 Churchill to win the St. James's Palace Stakes at Ascot! Racebets offer 50/1 on ANY Aidan O’Brien horse to win the 2017 Epsom Derby! "Royal Ascot: 66/1 ANY HORSE to win the Wokingham Handicap at Racebets "